I blogged the other day about a competition to visit all 47 prefectures in Japan in 100 days and help with tsunami cleanup. Just in case you don't win that, here's another chance to visit/help out. Many friends say they want to visit Japan, but they feel guilty about having fun when people in the North are suffering so badly. At the same time, it is difficult for those living outside of Japan, and those of us who don't speak good Japanese, to arrange any kind of volunteering. Luckily, Inside Japan Tours can help. They usually offer regular touristic tours of Japan, but in light of recent events and requests for help they have designed a volunteering trip. A 4 day trip to Tohoku in collaboration with a voluntary organisation currently working out there. 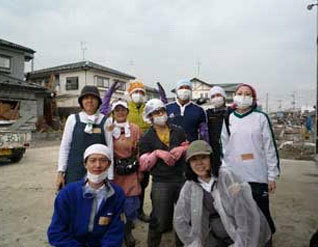 Includes transport from Tokyo, meals, accommodation, equipment and the help of an English translator throughout. Will assist with cleaning tasks, restoring houses and schools and removing rubble from roads, parks and rice paddies. Start dates are currently Thursday 18th August and Thursday 1st September. And trips cost 450GBP per person, not including flights. So if you can or will be here in Japan, here's a chance to do your bit. Those of you living out here with more time to organise might want to try PeaceBoat, who will accommodate you free of charge for week-long volunteering trips.